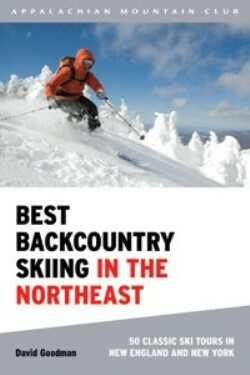 Best Backcountry Skiing in the Northeast, by David Goodman, 2010. The third edition of David Goodman's "bible of Eastern backcountry skiing" combines his previous Maine/New Hampshire and Vermont/New York guides into one meaty volume. The 50 tours include a comprehensive guide to skiing in Tuckerman Ravine and other ravines in the Presidentials, as well as tours on other mountains such as Cardigan, Monadnock, Mansfield, Greylock and Katahdin. Also includes remote backcountry tours and hut-to-hut overnight trips. The descriptions are thorough and are accompanied by new topographic maps by AMC cartographer Larry Garland. Also has an excellent introductory section on backcountry skiing history and skills. 352 pp, 6" x 9."